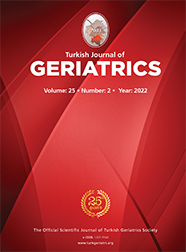 3Afyon Kocatepe University, Public Health AFYON Introduction: The purpose of this study is to investigate the effects of anesthesia techniques on intensive care admission, postoperative complications and mortality in elderly patients undergoing elective bilateral knee replacement surgery. Results: 108 females and 27 males, a total of 135 patients, were included in this study. 83 patients were operated under general anesthesia while 52 were under regional (epidural+spinal) anesthesia. 123 (91.1%) of patients were admitted to service after operation while 12 (8.9%) of them were admitted to the ICU, 10 (7.4%) of whom were in Group G (general anesthesia) and 2 (1.5%) in Group R (regional anesthesia) (p>0.05). The development rates of complications were significantly higher in Group G (11.1%) than in Group R (0.7%) (p=0.005). Hypertension was the most frequent concomitant disease and acute renal failure was the most frequently observed complication. 15 of 16 patients in whom complications were observed had hypertension. Mortality was 1.48% .